This is a YouTube playlist of the songs on Greatest Hits, Volume I & II (video and audio). Click on the icon in the upper left corner for a list of songs. 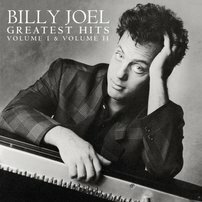 Billy Joel's Greatest Hits Volumes I & II is one of the top-selling albums of all time. 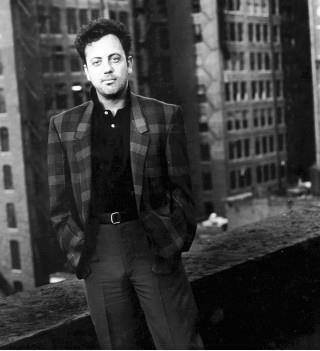 Released in 1985, the two CD set was a solid collection of Billy's hits and also included some tracks that were never released as singles but which were essential to any Billy Joel compilation such as "Captain Jack," "Scenes From An Italian Restaurant," and "New York State of Mind." For years, this was the definitive Billy Joel collection before The Complete Hits Collection came out in 1997. A television commercial for Greatest Hits, Volumes I and II can be seen here (YouTube link). As with any collection, there were some hits that were noticeably absent such as "Honesty," and since the collection was a "hits" album it did not include some of Billy's best songs like "Summer, Highland Falls" or "Vienna" which had never been released as single. But overall Greatest Hits I & II does a good job of covering Billy's most popular songs from the 70s and early 80s. It did include "New York State of Mind" and "Scenes From An Italian Restaurant," neither of which had been released as singles. Billy would release Greatest Hits, Vol. III in 1997 and The Complete Hits (containing Greatest Hits I, II and III) in a boxed set that same year. 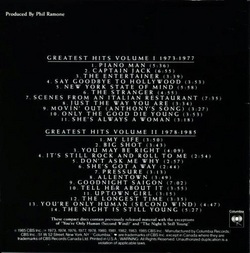 Two new songs were included on Greatest Hits, I & II, "You're Only Human (Second Wind)," and "The Night Is Still Young." The first was a bouncy, synth-driven song that was a response to teen depression and suicide, but it sounds a bit contrived and dated today. In contrast, "The Night Is Still Young," is the kind of mature pop song that foreshadowed Billy's late 80s and early 90s work. To see a special MTV television program from 1985, MTV Liner Notes, about Greatest Hits I and II, click here. The album was remastered and re-released in 1998. 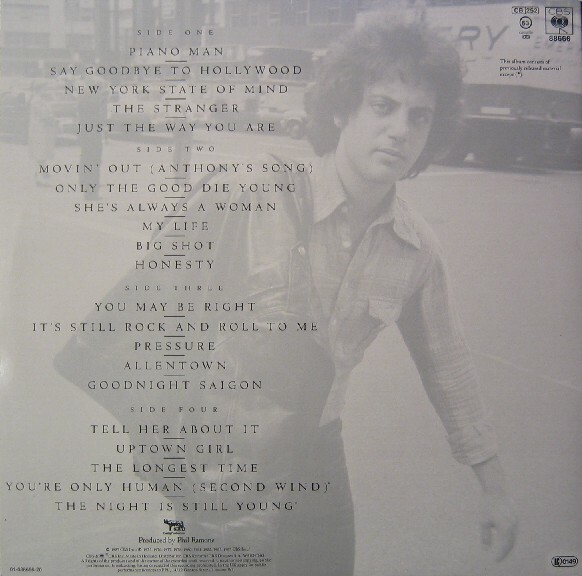 The original LP had included edited (shorter) versions of: "The Stranger", "Just the Way You Are", "My Life", "Big Shot", and "Pressure", and live versions "She's Got a Way" and "Say Goodbye to Hollywood" from Songs In the Attic. The remastered version in 1998 had the full versions of these previously edited songs, and the studio versions of the two live songs. The 1998 version is the one to get. The next year in 1986, the first collection of Billy's music videos came out: The Video Album, Volume I and The Video Album, Volume II. Both were released on VHS. Most of the music videos from these two collections were re-released on DVD in 2001 as The Essential Video Collection along with music videos made after 1986. As above, here is a YouTube playlist of the songs on Greatest Hits I and II, plus a few bonus items. Back cover of original vinyl LP. This is a live performance of "Only The Good Die Young" from Farm Aid, just a few weeks after the release of Greatest Hits I & II. Randy Newman accompanies Billy on the other piano. MTV Liner Notes program on The Greatest Hits, Vols. 1 and 2. Meredith Viera interviews Billy Joel in 1985, Part 1. Meredith Viera interviews Billy Joel in 1985, Part 2.